Hello hex•fury! The newest fastest USB Bitcoin miner of the world. - Supported software: cgminer 3.8.2 and up, BFgminer 3.7.0 and up. 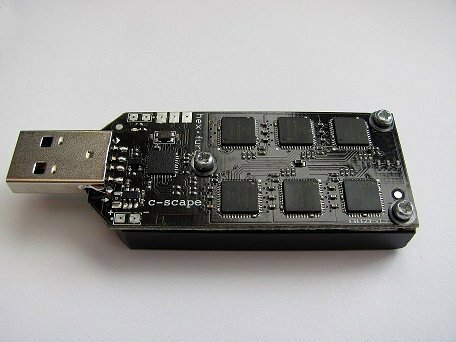 Same as the bi•fury, this beautiful and very efficient USB miner is developed by intron and c-scape. They made it to fix some amazing work again. The first release about the building process of this nice little piece of art is for Bitcoinmagazine.com. I had the honour to ask intron some questions about the hex•fury. Christien Havranek: Please tell me something more about the guys (or quite little animals – as I look to your profile pictures at Bitcointalk.org) who made it to develop the fastest USB bitcoin miner of the world.intron: c-scape made the firmware, and I did the hardware. And the production has been done in China. We both studied Computer Technology on the Delft University of Technology (TU-Delft) and we are already working together for years to develop embedded electronics. LordTheron, from England, is the person that made the production possible.CH: How did the developing process go this time?intron: One of the stumbling blocks you always have when designing a Bitcoin miner is the power supply, the energy supply system of the chips. To prevent too much warmth generation, the supply voltage of the chips is kept as low as possible, normally around 0.85 Volts. When the number of these chips increase to make a bigger miner some technical difficulties with this power supply emerge.With the hex•fury we solved this on an entirely unorthodox way with connecting the chips totally different. This is a very special feature of the bitfury chip and is called ‘string configuration’, something that I have never seen before. It makes a part of the design very simple and the price of the new miners much lower than that of the traditionally designed ones.We did not know about the working of this new way of configuration before, but after a long time of designing and testing (with the help of tytus from Poland) we knew how to make the strings. We helped building the biggest Bitcoin miner of North America, which is even one of the biggest miners ever. It makes 1,000 trillion calculations per second and mines around $8 million dollars a month (Please take a look at this video of the miner: https://www.youtube.com/watch?v=ELA91d_mx80) This resulted into the connection system which is used for the hex•fury now and after this also has been used for the One String Miner.We did not use this technique for the bi•fury, because this miner just got two chips so a string configuration does not make sense. Just when the total sum of the voltages per bitfury chip is the same as the main power, a string design can be very useful. (For the nerds among us: 5 Volts with an USB miner yields 6 chips and the 12 Volts of an OSM has 15 chips. )CH: Why is the hex•fury produced as it is now, and for example not as a big device that is even faster?intron: We wanted to make a miner that fits into an USB port. So it should not be too big and it has to work with the 5 Volt USB power. After some counting this means six chips in a string: one bitfury chip got a maximal approximate hashrate of around 2.5 GH. So a bi•fury with 2 chips reaches 5 GH and a hex•fury with 6 chips reaches 15 GH.CH: What are the hex•fury biggest concurrences at the moment?intron: There are a lot of other USB miners at the market, for example the bi•fury, the predecessor of the hex•fury. But the hex•fury is the fastest miner of the world at the moment. It has a speed of 11 GH/s when used normally and with overclocking it can even reach a speed of 15 GH. The overclocking is made possible very simply by increasing the supply voltage from 5 Volts to up to 5.5 Volts.CH: When people want to start mining bitcoins, and this hex•fury is their first tool, what do they need to get started?intron: They need a USB hub with an external power supply and a PC running a mining app. And they should log in at a mining pool like BTG Guild or Eligius or one of the many others out there. And I would like to recommend a good forced air cooler. Because this thing is getting hot when overclocked. A beefed-up USB hub.The low-cost adjustable 5V/5A power supplyallows for easy overclocking.CH: Did the fall of MtGox had influence on the building process of the hex•fury? And do you think it will have influence at the sales?intron: The fall of MtGox had no influence at the development of the hex•fury as it has nothing to do with what is happening with the diverse exchanges and other Bitcoin related authoritative sources. All the people who worked on the hex•fury still believe in the power of Bitcoin. I got no idea how the sales is going to be. Of course it can turn into both directions. People can get afraid because of certain big accidents like the one of MtGox and avert to crypto currencies. But they can also discover that they are part of a very exciting, worldwide game and realize that they would like to go on participating in it. A large group of hex•furies, the big brothers of the bi•fury.